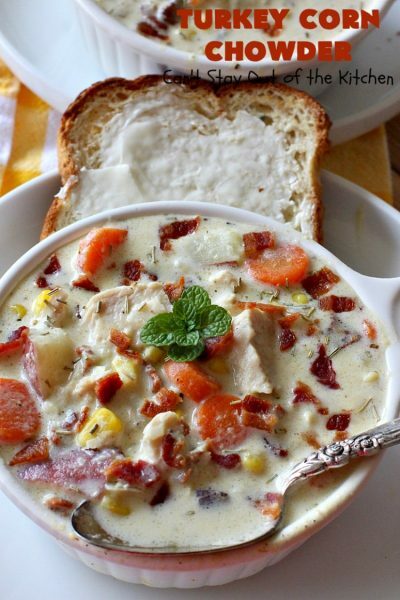 Turkey Corn Chowder is awesome! It’s also a scrumptious way to use up leftover turkey and turkey broth from the holidays! Plus, it has bacon! Everything is always better with bacon. 🙂 This soup is thickened when you puree half-and-half and corn together in a blender. It thickens the soup wonderfully. The primary seasoning for the chowder is rosemary. This is such a hardy herb that it is still growing in my pots outside in December and we’ve had a couple of freezes by now. Bay leaves and garlic add flavor. Potatoes, carrots and onions add texture along with the turkey and corn. 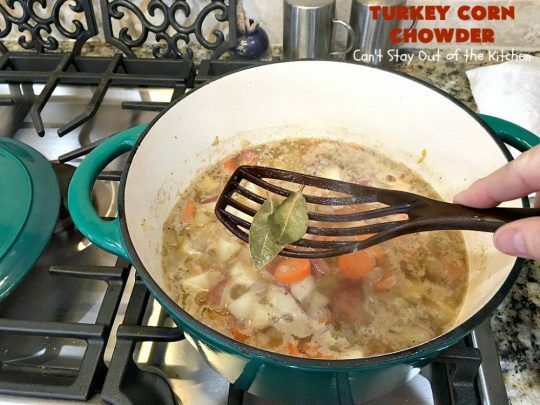 I saw this recipe right around Thanksgiving and knew it would be a fantastic way to use up leftover turkey. Boy, was I right! It was so mouthwatering. I had a bowl of this soup for lunch for several days and just loved the stuff. 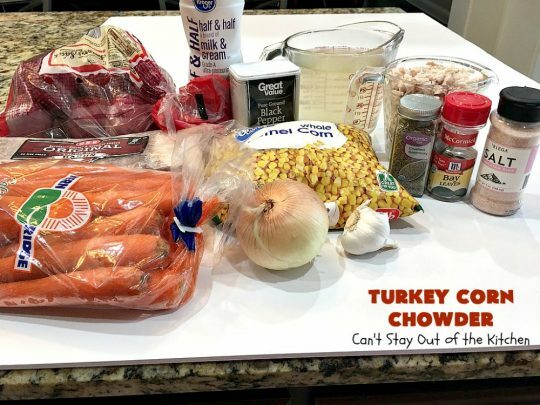 I love soups anyway, especially chowders that are thickened with cream. Yes, my weakness. I try to eat more soups that are broth-based to cut calories. But every now and then it’s good to splurge. Turkey Corn Chowder is such amazing comfort food that you hardly need anything else to accompany it. I served it with some leftover Gluten Free Cheddar Bay Biscuits that I made for Thanksgiving dinner. The combination was heavenly. This recipe is naturally gluten free since it’s thickened by corn and half-and-half. It’s not low in calories since it uses both bacon and cream. But if you’re looking for a dynamite way to use up leftover turkey, this is it! 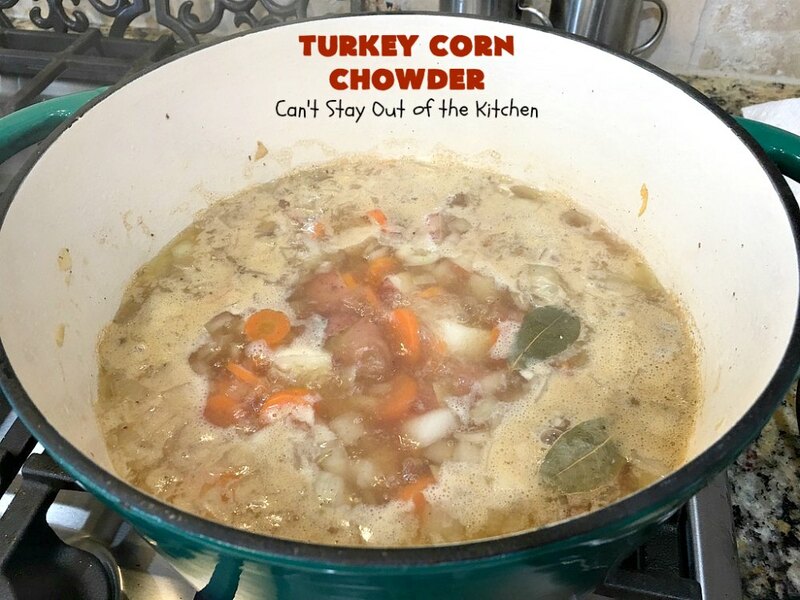 When I initially posted this recipe in December 2016, I was really disappointed with my pictures. I accidentally burnt the bacon and did not have any more to redo the recipe. While the recipe was fabulous, the pictures didn’t show it. I recently remade this recipe (February 2019) for our Friday night care group. This time I changed up a few things. I added a lot more whole kernel corn because I thought the recipe needed more. I cooked off five additional slices of bacon for garnish. But since I didn’t need but one strip, I added the rest of the bacon into the pot. Yum. I didn’t have fresh rosemary this time, because my plant died. I used dried rosemary instead. I also took out the one tablespoon of gluten free flour and scrapped it entirely. One of the girls who attends our Bible study on Friday nights is allergic to rice. Truthfully, this recipe really doesn’t need any extra thickener. I didn’t have turkey on hand from Thanksgiving or Christmas. So I purchased turkey cutlets. I cooked them off in the crockpot with a lot of water so I could have the broth to make this recipe. You can do the same or substitute chicken for the turkey and chicken broth for the turkey broth. Both ways work amazingly well. Even still the soup turned out sensational. Every single person in our care group had two bowls. They raved over the soup. Several people wanted my updated recipe. One guy told me this was his kind of comfort food. I believe it will be your kind of comfort food, too. Turkey Corn Chowder is one of the best soups you’ll ever eat! The combination of flavors is amazing. 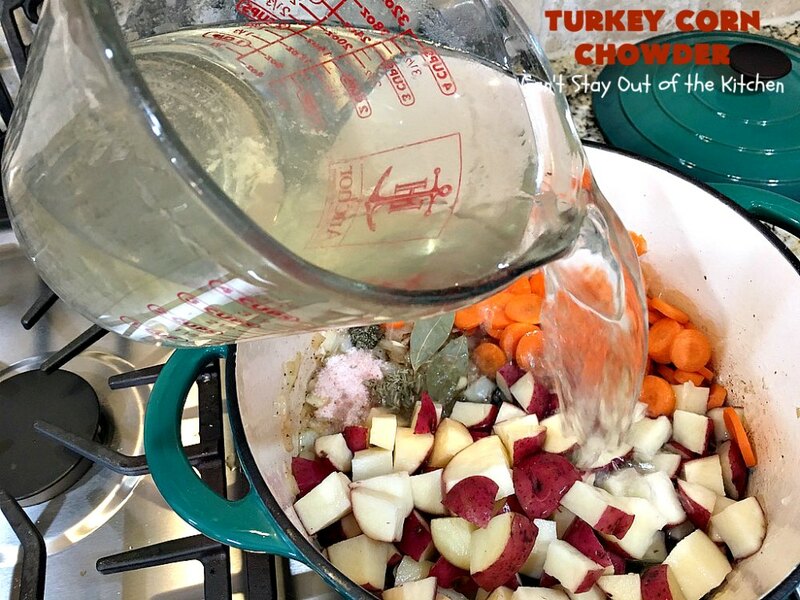 This is a great way to use up leftover turkey and turkey broth after the holidays. 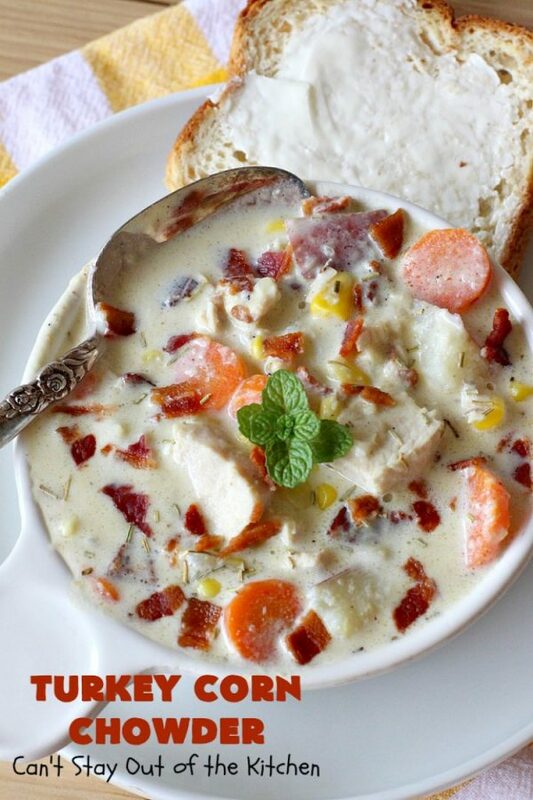 Turkey Corn Chowder is garnished with bacon so it packs a powerful punch! The first time I made this recipe I served it with homemade Gluten Free Cheddar Bay Biscuits. I used these ingredients. 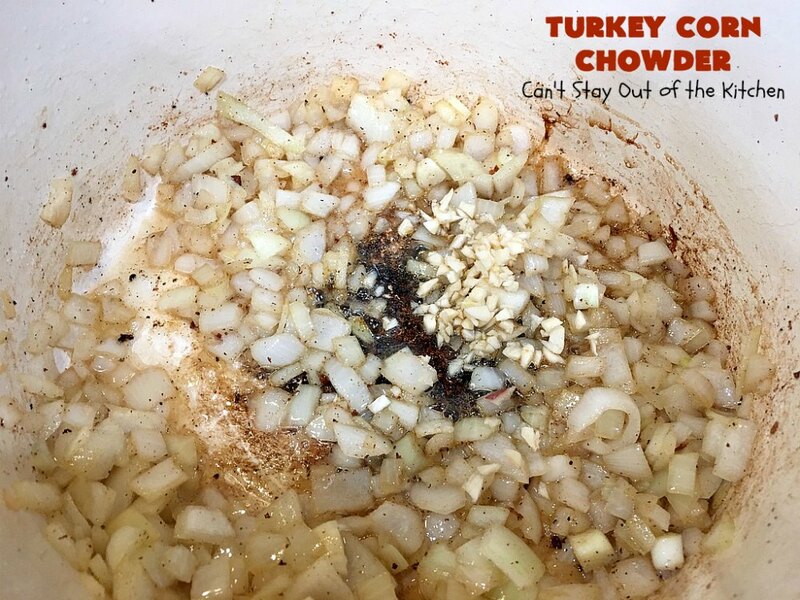 I cooked off turkey cutlets in my crockpot providing the broth and meat for the recipe. I used more corn that what’s shown in this picture. Slice bacon in half lengthwise. Then cut down in 1/3 to 1/2 inch pieces. Fry in a large Dutch oven or stock pot over medium heat. Remove bacon to paper towels. Do not drain grease from the Dutch oven. To grease in pan add onions. Saute a few minutes until onions are tender. Add garlic and saute another minute until garlic is fragrant. Add potatoes, carrots, bay leaves, salt, pepper and thyme. Add turkey broth. Stir to combine. Cover with lid. Bring ingredients to a boil. Reduce heat and simmer 15-20 minutes, or until potatoes and carrots are fork tender. 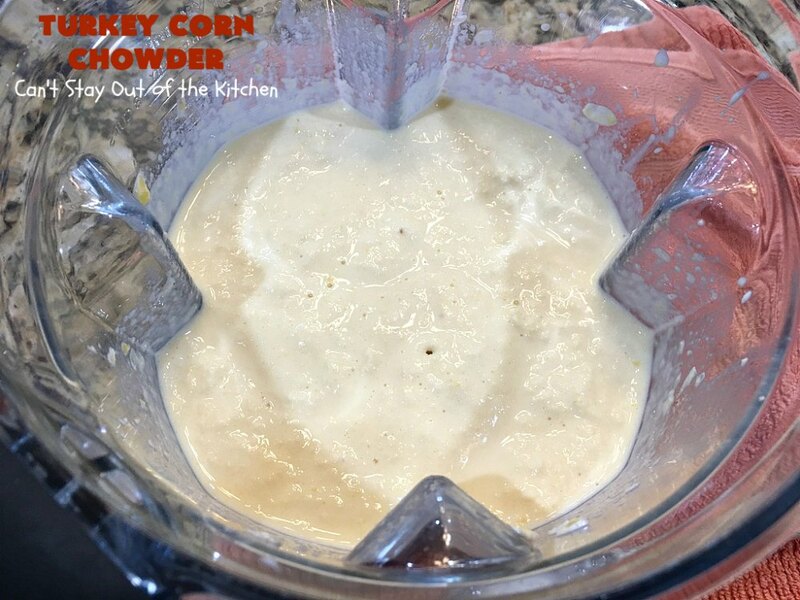 Combine half-and-half cream with one pound of whole kernel corn in a blender. Process until smooth. You will probably have to use a wooden spoon and move stuff around every few seconds so the corn doesn’t get stuck under the blade. I added an additional 1/2 cup of half-and-half to get the ingredients to process more easily. The texture needs to be silky smooth. My Vitamix did this in about 30 seconds. Other blenders may take 2-3 minutes. Add the blended half-and-half/corn mixture to the Dutch oven. 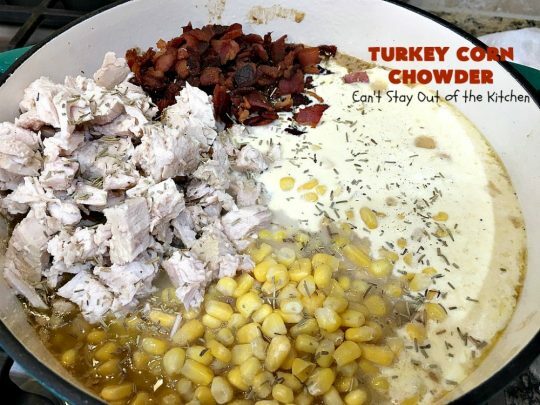 Add remaining corn, turkey, bacon and rosemary. Heat through. Garnish soup and individual bowls with bacon and rosemary, as desired. 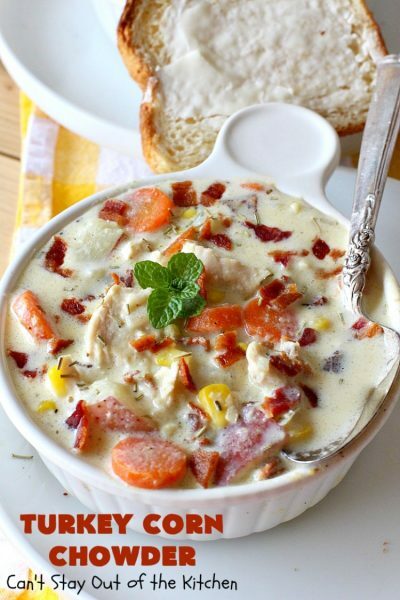 Ladle Turkey Corn Chowder into bowls and top with bacon. Garnish with fresh rosemary. 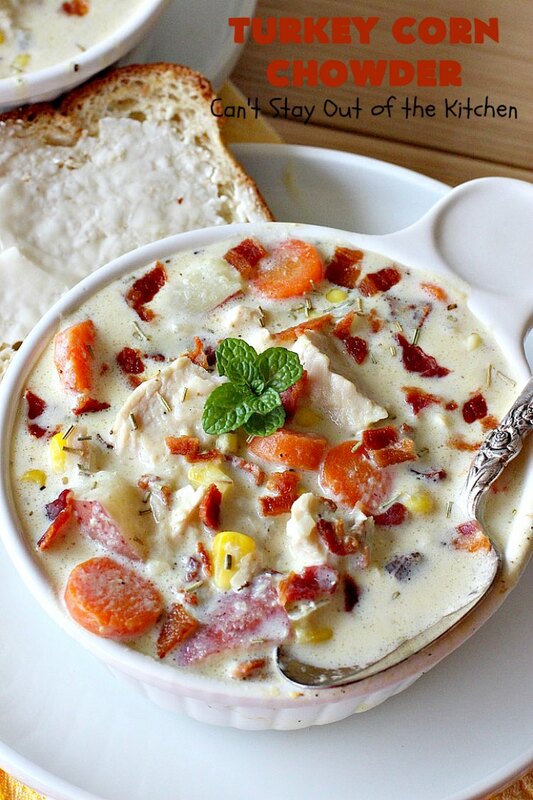 Turkey Corn Chowder is gluten free. So are the biscuits if you’re trying to keep to a gluten free meal. 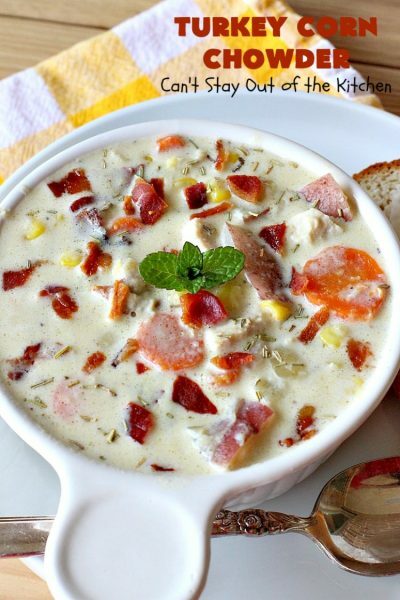 This fabulous chowder is thickened by pureeing half-and-half cream with corn! The combination of flavors in this soup, plus bacon for garnish, is irresistible. Great way to use up leftover turkey. It's terrific for cold, dreary winter days. 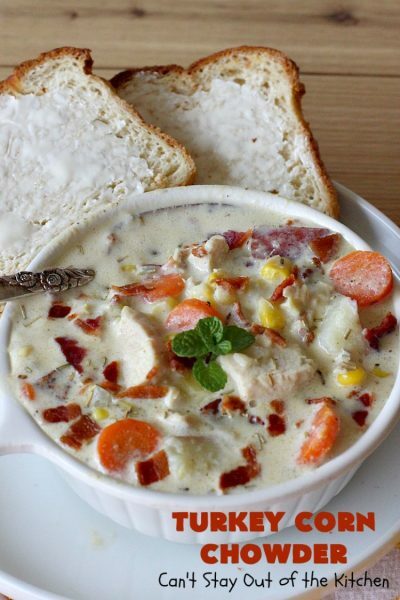 You'll find it the perfect comfort food for fall or winter. Gluten free. Cut bacon strips in half lengthwise and then cut strips again into 1/3 to ½-inch pieces. In a large Dutch oven or stock pot, cook bacon over medium heat until crisp, stirring occasionally. Remove bacon with a slotted spoon and place on paper towels to drain. Add diced onions and cook for 2-3 minutes or until tender. Add garlic and cook an additional minute until garlic is fragrant. 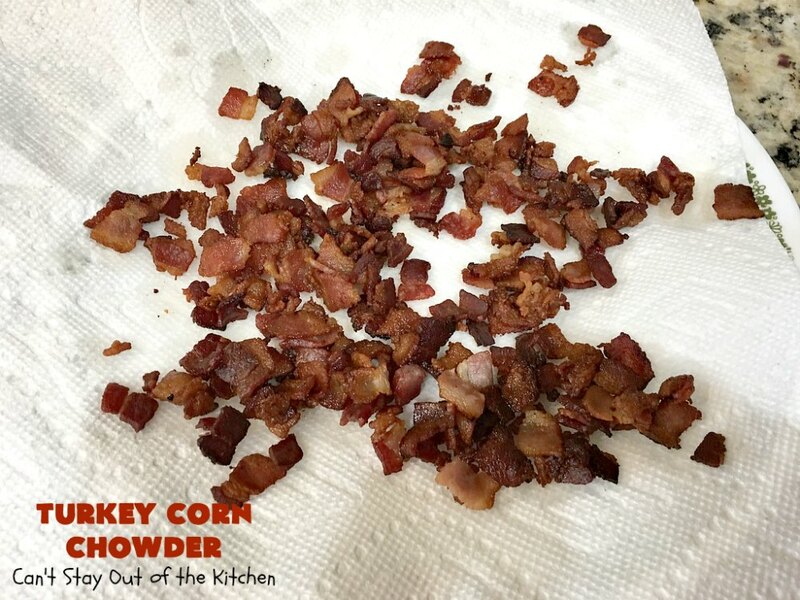 Be sure to scrape the bottom of the pan for pieces of bacon and stir them into the mixture as they increase flavor. 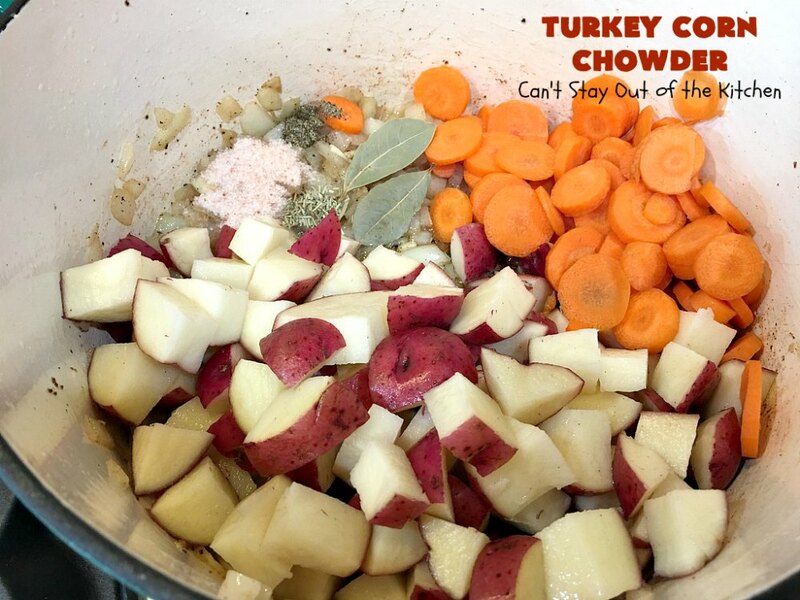 Add turkey broth, carrots, potatoes, bay leaves, 2 teaspoons of fresh minced rosemary or ½ tsp. dried rosemary, salt and pepper. Bring ingredients to a boil, then reduce heat and simmer. Cook for 15-20 minutes or until potatoes and carrots are tender. Meanwhile, combine half-and-half cream and one pound of thawed corn in a blender. Blend for 1-2 minutes or until mixture is silky smooth. Be prepared to stop and stir frequently, so corn doesn’t bog down in the blender. After carrots and potatoes are tender, remove bay leaves. 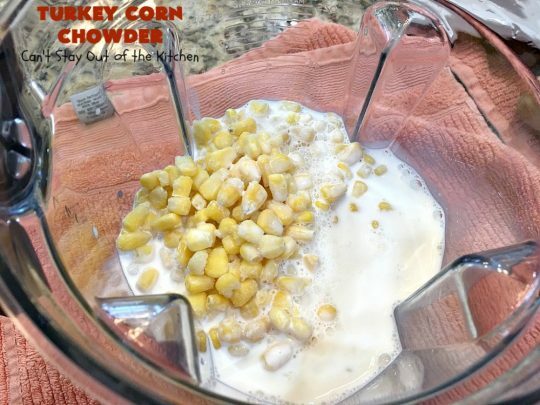 Add the blended corn and half-and-half mixture to the pot. Stir in additional 2 teaspoons of fresh minced rosemary or 1 tsp. dried rosemary, turkey, remaining whole kernel corn and bacon. Return to heat and continue cooking until mixture is heated through. Garnish with additional cooked bacon and fresh minced rosemary, if desired. NOTE: I had to use 2 ½ cups half-and-half in order to get my Vitamix to blend without bogging down each time after one second. NOTE: My Vitamix was able to get the correct texture for the corn after about 30 seconds on high speed. NOTE: I only put about a pound of corn in the blender with the half-and-half. The rest I kept whole for the soup. NOTE: I ended up needing only about one slice of bacon for garnish. I tossed the rest of the bacon in with the soup. 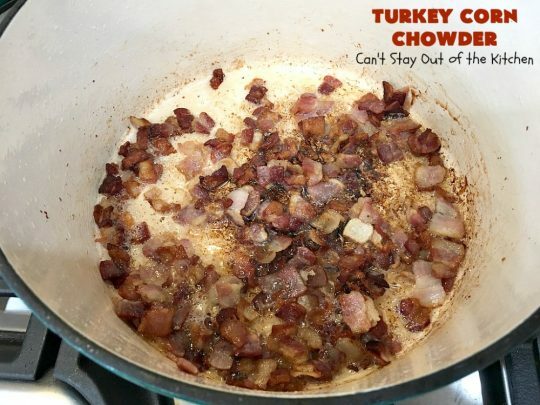 In other words, the soup had over a pound of bacon. So yummy. 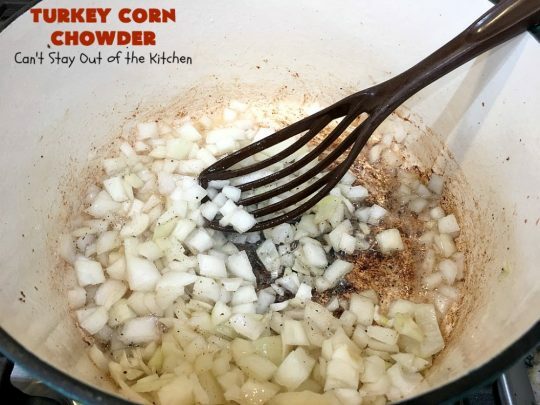 Blending half-and-half cream and corn is an ingenious way to thicken the soup. 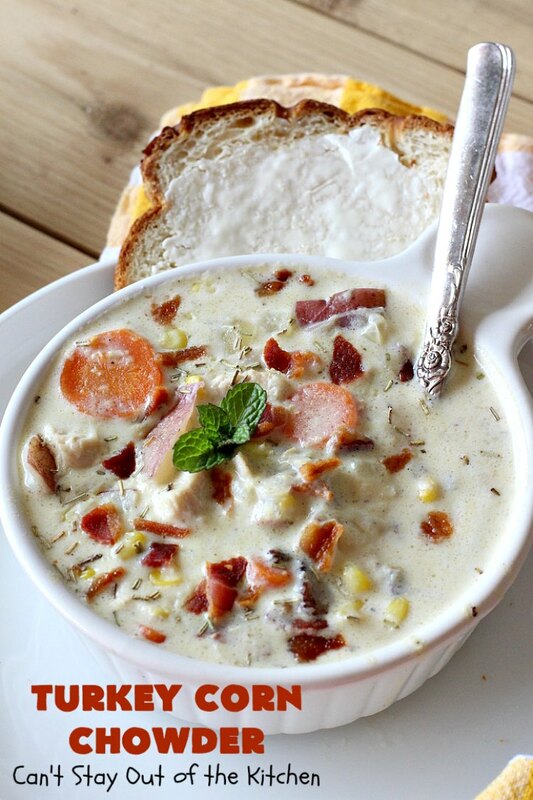 I was a very happy camper after the opportunity to eat this fabulous chowder for a few days! 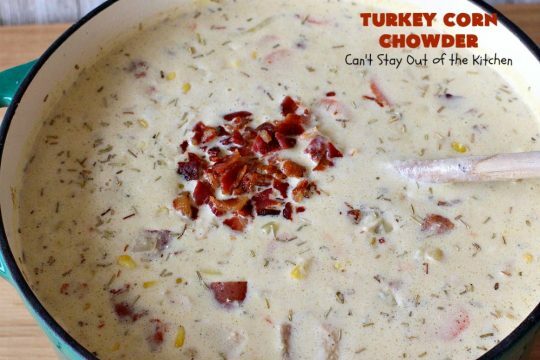 I love bacon in anything and it’s certainly good in Turkey Corn Chowder.